Boy, this post has been a long overdue! After 5 previous visits to Portland where we did not visit Pok Pok, it would involve a group of 4 adults and 4 kids (ironically) for us to finally try their famous chicken wings. Yah, not exactly the type of food that is necessarily kid-friendly, but we made it work. In fact, I had to get a reservation that enabled us to walk right in without waiting. Imagine waiting with so many kids in tow? Even the biggest appetites would be lost with 4 kids a complaining! 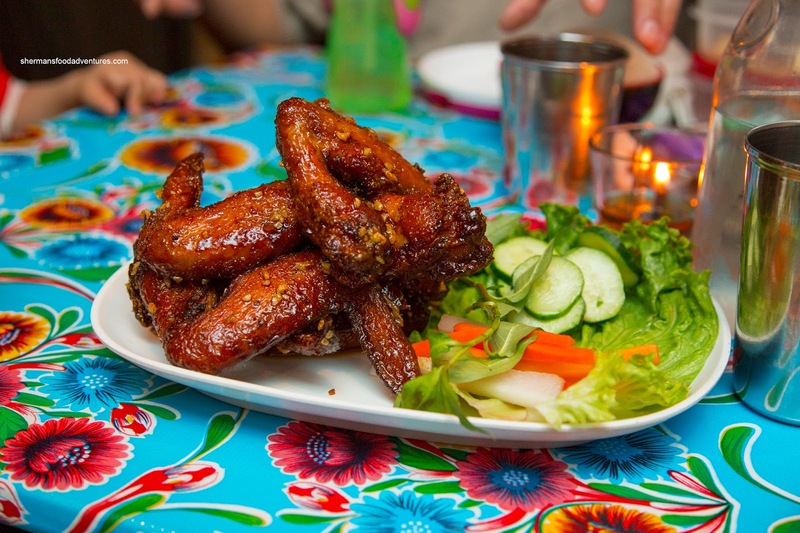 So without further ado, we need to talk wings, specifically Ike's Vietnamese Fish Sauce Wings. These suckers are as infamous as Charlie Sheen's love life. Recommended by many, the wings are marinated in fish sauce and sugar, then deep fried and tossed in caramelized Phu Quoc fish sauce and garlic. Well, did they live up to the hype? I would say generally yes because they were moist and juicy on the inside where the brine penetrated throughout. The glaze on the exterior was intoxicatingly pungent for all the senses. The sweet and salty caramelized flavors were only further amped by the garlic. 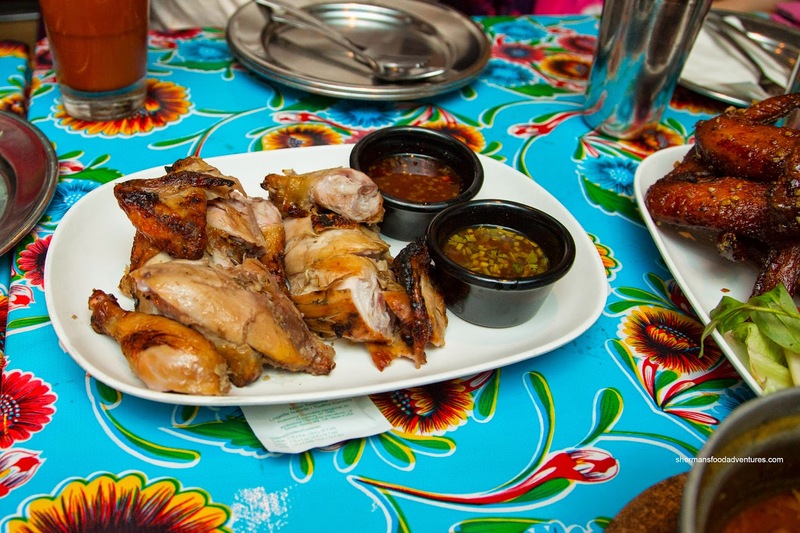 Up next we tried the Kai Yaang or whole charcoal roasted game hen stuffed with lemongrass, garlic, pepper and cilantro. Considering the pungency of the ingredients used to season the hen, the resulting flavors were quite mild and muted. With that being said, the chicken itself was still flavorful and moist. Served on the side was 2 dipping sauces including a spicy sweet & sour and tamarind. I thought the tamarind was the better fit. 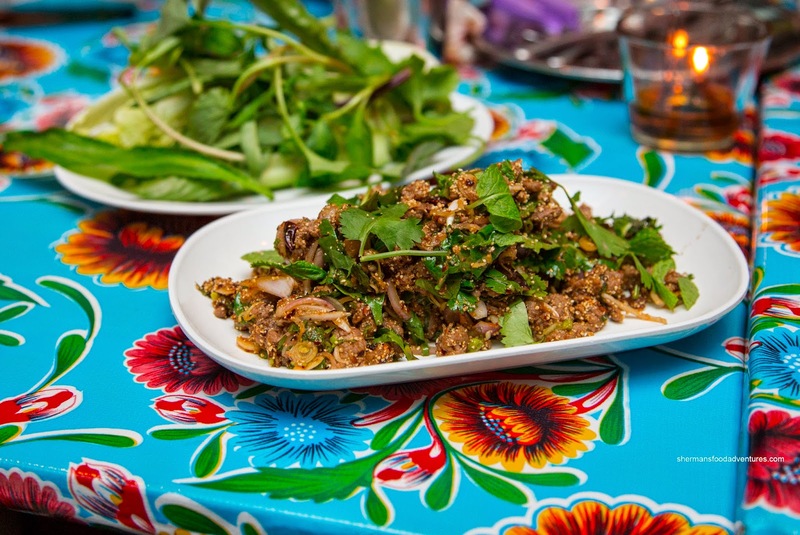 Onto a salad of sorts, we had the Laap Pet Issan consisting of chopped duck, duck liver, skin, lemongrass, herbs, toasted rice powder, dried chilis, lime juice and fish sauce. This was yet another impactful dish in terms of spiciness. There was a considerable amount of lingering bite to the dish from the red chilis. However, the other ingredients were not overwhelmed as the lemongrass and shallots made their presence felt. With a balance of sweetness, saltiness and acidity, this was a complete flavor explosion. The side of Phak Sot helped bring things down a notch though. 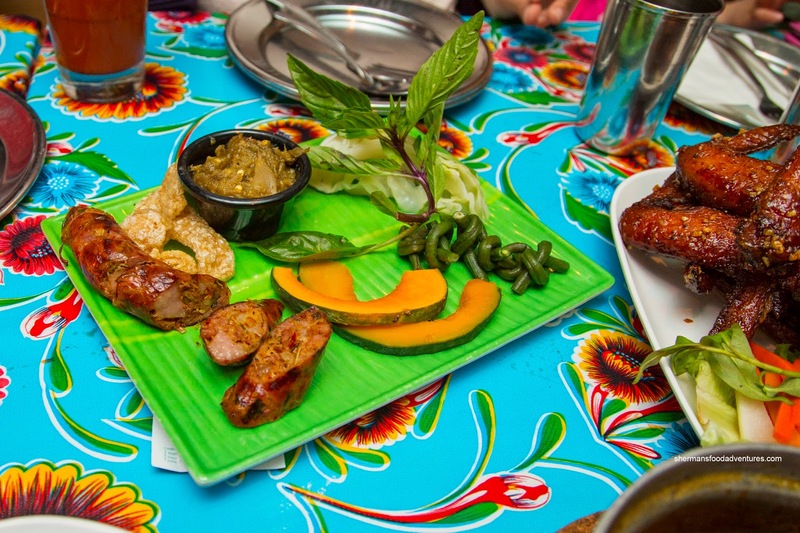 Interestingly plated, the Sai Ua Samun Phrai was comprised of Chang Mai sausage with herbs, Burmese curry powder and aromatics. This was charcoal-grilled and served with spicy green chili dip, Thai pork rinds and steamed crudités. Meaty and understatedly spicy, the sausage was nicely accented by the cooling of the green beans, cabbage and golden squash. 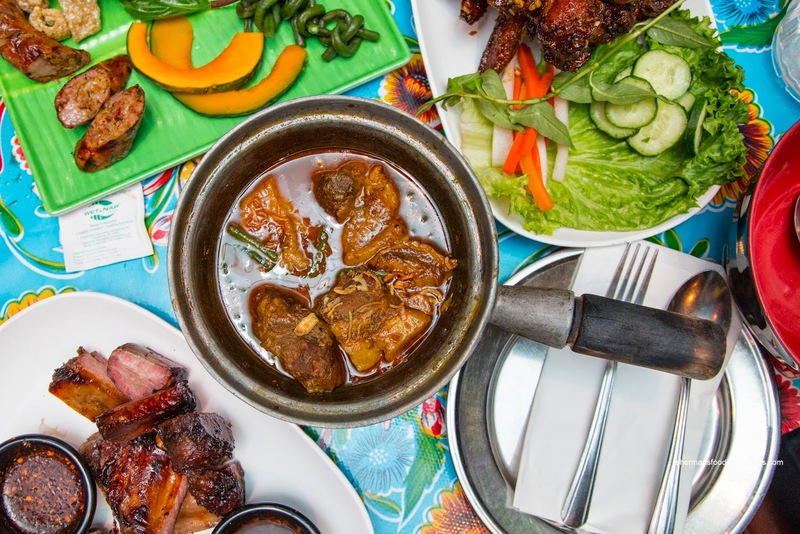 Served in a hot pot, the Kaeng Hang Leh (or pork belly and shoulder curry with ginger, palm sugar, turmeric, tamarind, Burmese curry powder and pickled garlic) was a table favorite. Notably sweet with hints of ginger, the tang of tamarind while mild in spiciness, this went well with both the jasmine and sticky rice. Naturally, the pork belly was fatty and melted-in-our-mouths while the shoulder was fork tender. Too bad there wasn't much of it. 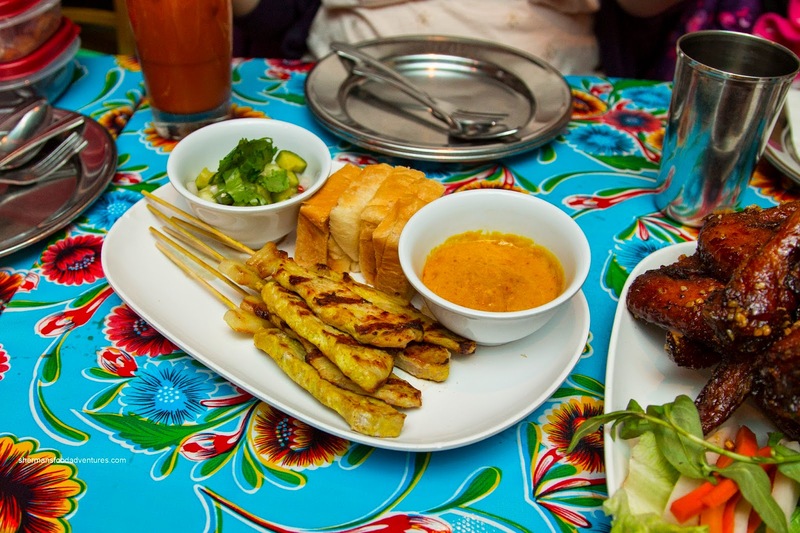 Mostly for the kiddies, we ordered the Muu Sateh or pork loin skewers marinated in coconut milk and turmeric. These were grilled over charcoal and served with peanut sauce, toasted bread and cucumber relish. We universally agreed that this was the weakest dish of the meal as the pork was rather dry and chewy. Although it was aromatic from the coconut milk, there was little impact. However, the peanut sauce did help with a certain sweet aromatics. 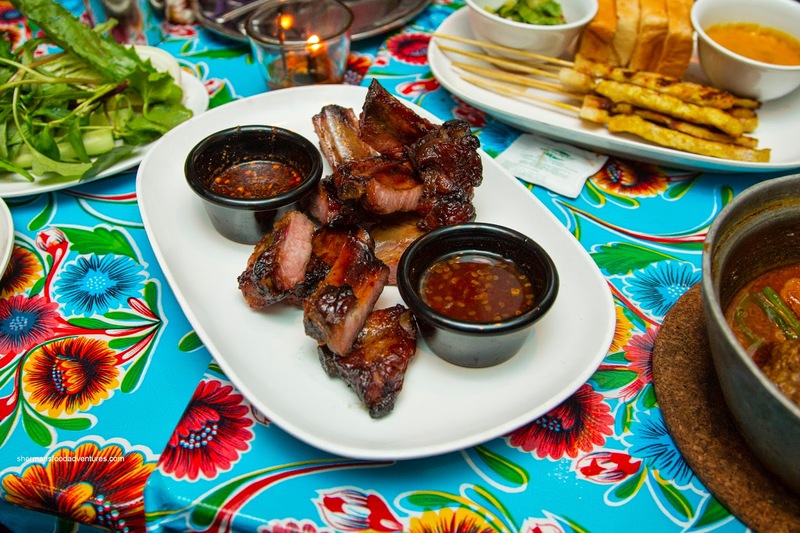 Lastly, we had the Sii Khrong Muu Yaang or baby back ribs marinated in lao jiin, soy, honey, ginger and Thai spices. These were slow roasted and served with 2 spicy dipping sauces. The ribs themselves were firm with a smoky charred exterior. These reminded us of Chinese BBQ ribs. On the other hand, the dipping sauces kicked it up a notch with one being quite savory while the other being rather sweet and tangy. 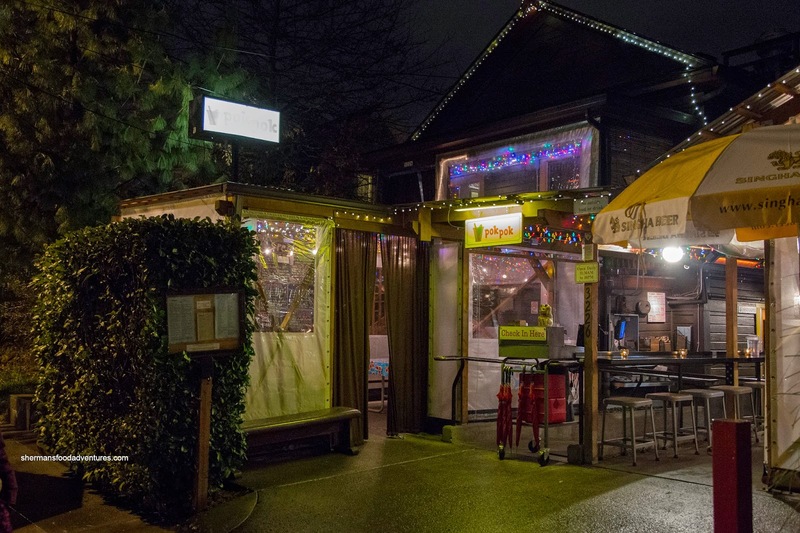 Now the question of the moment: did Pok Pok live up to expectations considering the hype and accolades? Well, if we look at the wings alone, I would say yes. On the other hand, the meal as a whole was not bad with a few weak dishes. So I guess one's experience would be dependent on what you order. If the place is pack there is a cool food truck park across the street, where you can eat on their tables.